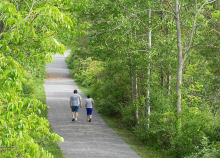 Preserving greenspace requires donations of funds, land, goods, and services. You can contribute in a variety of ways. See below for details. The Henrietta Foundation Inc. is registered with the Internal Revenue Service (IRS) as a not-for-profit, 501 (c)(3) organization. Your donation is tax deductible to the extent that the law allows. Please consult with your tax adviser to review your specific situation. Or use the secure PayPal link below. There is no nicer way to honor a friend or family member than to dedicate a tree or a bench to them. For a donation of $375 the Foundation will dedicate a tree in their honor or memory, and for $425 we will dedicate a bench in their name. A plaque will be displayed to commemorate your loved one. Please contact President Bud Snyder at (585) 334-1300 for more information, or use the secure PayPal link below. Please consider including the Foundation in your estate planning. Contact your estate attorney and financial planner for more information on how you can leave a bequest to benefit Henrietta’s conservation land trust for generations to come. If you are interested in donating land, funds to buy land, or in pursuing a conservation easement, please contact Foundation President Bud Snyder at president@henriettafoundation.org, or call the Foundation at (585) 334-1300. You can also support the Foundation by donating your car, boat, truck or RV to Charity Fundings and designating us as the beneficiary. Please call Charity Fundings at (585) 426-1030 for more information about this easy way to give. 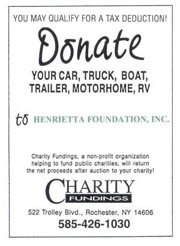 Businesses and organizations that are interested in placing an ad on our web site are encouraged to call President Bud Snyder at president@henriettafoundation.org, or (585) 334-1300 for more information.